1st Dec 2014 – We are delighted to announce the publication of a landmark research report called Generation 2000, which presents for the first time, benchmark data and wide-ranging findings on the online and digital media habits and digital literacy of over 2000 Year 9 pupils (13 and 14 year olds) from across Wales. 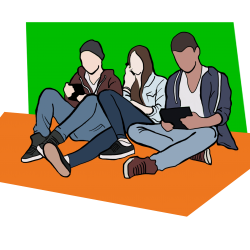 The research led by WISE KIDS and co-funded by the Children’s Commissioner for Wales, Logicalis and S4C explored young people’s online experiences in a social and educational context. Undertaken earlier this year, it was made up of qualitative and quantitative parts which included group interviews, one-to-one home interviews, and an online questionnaire. The report urges policy makers and educators to take a bold approach to digital literacy in schools and says that Wales needs to raise its game if it wants to deliver a truly 21st century education. It provides valuable insights for policy makers, and recommends that technologically savvy children should be trusted to become partners in their own education. It also reveals the disconnect between children’s digital experiences at home and in school, and calls for high quality technology and Internet access in all schools across Wales. Improved digital literacy training for teachers and pupils is also needed to avoid a digital skills divide. Technology provision in schools is lagging behind and needs to improve. Only 44% of children think their schools have good technology for lessons. Welsh speaking children say they want more online resources in Welsh. There is a disconnect between pupils’ digital habits at home and in school: 31% of children undertake daily informal learning (such as looking up information on personal interests/ reading or watching the news), compared with only 17% who use the Internet daily for school related work. Contrast this with 75% of children who use the Internet daily to connect with friends. Given the wealth of high quality online resources available, pupils do not take full advantage of the opportunities to use the Internet for school work. They also still use a limited range of websites, and copying and pasting is a common practice in research for homework/revision. Schools need to rethink how they engage with pupils in digital literacy and online safety, and work on the basis of trust to support pupils to develop responsible, self-governing digital habits. Pupils are experts on their own Internet use and experiences, and schools should learn from this. In particular, for online safety education, schools should work with pupils as co-creators of peer-led programmes that can contribute to a school culture of digital citizenship. Parents also need to become more digitally savvy, so they can support their children to use the Internet effectively and safely. The research highlighted that children are creative and confident in dealing with the inevitable negative aspects of the Internet, developing a range of active coping strategies. This resilience is an important skill, considering that 42% received messages that upset them from peers and others they interacted with online. Schools need to focus on supporting pupils to build resilience so they can manage online risk. Smart phone and tablet use is linked to higher skills and take up of activities.